SpaceX has successfully completed the first test of the company’s Starhopper vehicle. In addition to being the first test of the Starship prototype, it was also the first time the company’s next-generation Raptor engine was fired as part of an integrated flight vehicle. The “tethered hop” test of the Starhopper vehicle was conducted at the SpaceX Boca Chica launch facility in Cameron County, Texas at 00:56:25 UTC this morning. During the test, the vehicle’s solitary raptor engine was fired for approximately three seconds. 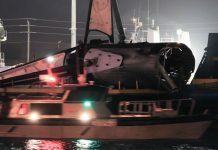 Following the completion of the test, SpaceX founder and CEO Elon Musk confirmed on Twitter that it had been successful. “Starhopper completed tethered hop. All Systems green,” he said. The successfully tethered hop follows nearly two weeks of preparation including at least five wet dress rehearsals. The rehearsals involved loading the vehicle’s propellant tanks and verifying the performance of its avionics and plumbing. The completion of the tethered hop test paves the way for untethered tests. These test will likely start with short hops of a few meters and ultimately culminate in tests lasting several minutes reaching altitudes of 5 kilometres or more. The first few untethered tests will utilise the vehicle in its current configuration. 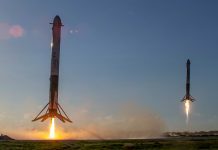 However, Musk has revealed that higher altitude testing will require the installation of two additional raptor engines.